Like most flight nurses in Western Australia, John gained all his nursing qualifications and experience elsewhere – RN Geelong Hospital, RM Royal Hospital for Women, Paddington, and PICUNrs Royal Children’s Hospital, Melbourne. With qualifications in hand, the world beckoned. After returning to Australia in 1992 for the birth of his first child, John applied for an advertised flight nurse position. That application went into the bin because, he was told by the the senior flight nurse, “you’re a male”. Fortuitously the next application landed on the desk of Geri Malone. The position in Alice Springs was filled, but Geri knew Derby would need a new flight nurse. And that’s how you joined the RFDS in 1994 – if you were a bloke. John was lucky enough to join Derby base when it was still Victorian Section. Amalgamation with the other two WA Sections in 1996 was traumatic, but on the upside it did open up career opportunities. 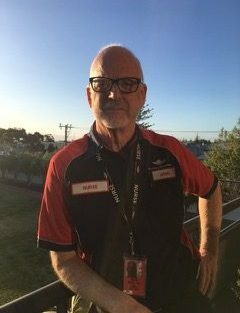 After seven make or break years in Derby, John was appointed to Senior Base Nurse, Jandakot (the base where his first application went into the bin). John first served on the FNA committee at the turn of the century. He is a regular attendee at the annual conference, and thinks flight nurses are such interesting people – they do extraordinary stuff, and they all have a story.